If you want a change of pace for breakfast, but you don't want to stray from oats (which are so incredibly heart-healthy), try these delightful overnight oats. You can add or delete anything you like! I eat mine cold, but some people like to slightly warm them beforehand. It's all up to your personal preference! Throw all the ingredients except for the banana and raisins/dried cranberries (unless you don't mind them bloated) in a jar and mix well. Store overnight in the fridge. When you are ready to eat, slice the banana and mix it in. I thought putting the banana in the night before would make it too mushy. 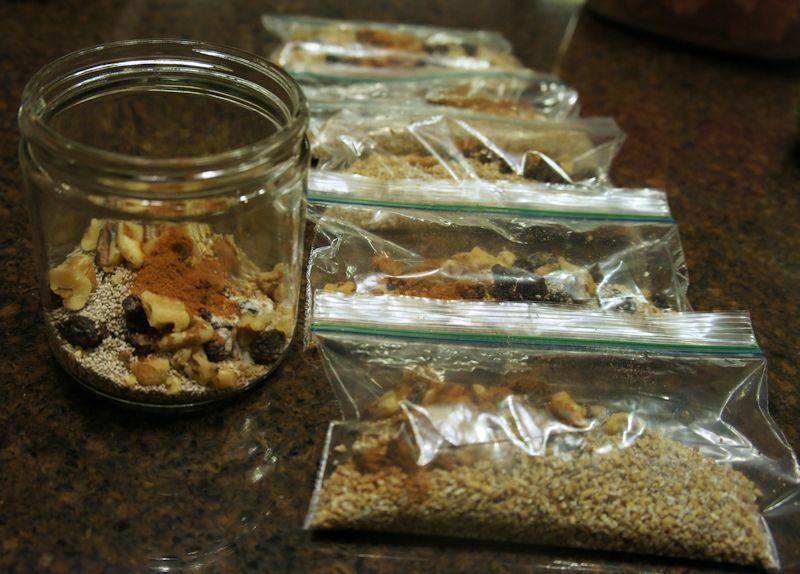 TIP: Make 5 baggies of the dry ingredients while all of your ingredients are out. 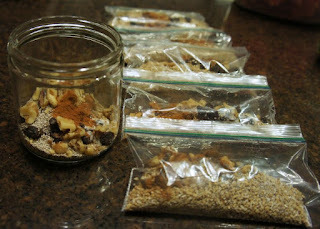 Then, each night, you can add the wet and dry ingredients into your jar and chill it. This saves a bit of time!